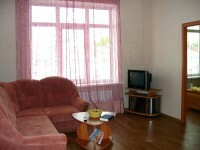 Apartments for daily rent in Simferopol. 2 bedroom apartment 75 $ / Simferopol / 10 , Karl Marx str. This spacious 2-bedroom apartment is in the best location, right downtown Simferopol. It is surrounded by fine dining, entertainment and all the major attractions at your doorstep. Save money on taxi and be near everything! The apartment consists of a spacious lounge area and two separate bedrooms, kitchenette and a bathroom. FREE Airport pickup (when you stay a week of more). Broadband Internet is available as an optional extra.